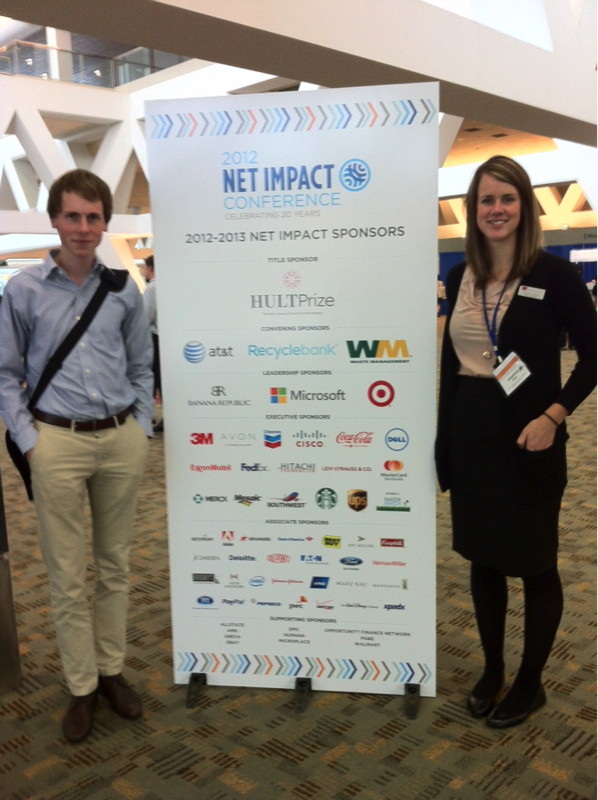 Joanna Kipp and Geordan Hankinson, co-presidents of the Net Impact Segal Chapter for the 2013 school year, recently had the great opportunity to travel to Baltimore to participate in the 2012 Net Impact Conference. When I arrived in Baltimore for the 2012 Net Impact Conference, I didn’t really know what to expect. Sure, I had downloaded the app and decided which sessions to attend – but nothing could have prepared me for what I was about to experience. In the two days I spent attending keynotes, breakout sessions and social events I learned more about how business can be used for positive impact than I ever imagined possible. I have been thinking a lot about how I can use my own future business career for good for a while now, even before starting the MBA program at SFU. Before the conference, I thought that the key to achieving my career goal of working in environmental sustainability had to start with getting a job with these exact words in the job title. Otherwise, my job wouldn’t allow me to make a difference, right? Wrong. A recurring and eye-opening theme of the Net Impact conference that really hit home with me was the fact that you don’t need to have sustainability in your job title, you can bring it to any job that you do! This concept was particularly impactful coming from two accomplished and inspiring speakers, Kurt Kehne (CFO @ UPS) and Jean Sweeney (Vice President of Environmental, Health, and Safety Operations @ 3M). In addition, Joaquin Duato (Worldwide Chairman @ Johnson & Johnson) said that every company needs champions for sustainability. So even if it is not part of your official responsibilities, you can (and should) incorporate sustainability as an overarching theme in your work. After hearing this, I have to admit I felt a little relieved. I have really been able to expand the range of options for my post-MBA career, and I’ve begun to think about what I can do to be a champion of sustainability no matter where I end up working. With this new idea planted in my brain, I attended a number of smaller, more personal sessions over the next 2 days. The conference was great in that it really allowed you to personalize your experience and tailor the sessions you attended to what you were most interested in. I also had the chance to meet with some of the panel speakers and some like-minded students that were in the same position as me with respect to feeling overwhelmed by career choices. It was empowering to connect with these people and hear their thoughts on choosing a career in environmental sustainability. In the closing keynote session, Net Impact’s President Liz Maw left the audience with a challenge: do you have the courage to lead us – rapidly – into a new world of responsible and sustainable solutions? Will you take a risk and challenge the status quo? After attending the conference, my answer to these questions is a definite “yes”.